Development of the new $260 million Gold Line Light Rail System between Los Angeles and Pasadena is intended to enhance mobility and improve the quality of life for area residents and commuters. In order to ease traffic congestion in the heavily traveled Pasadena/Los Angeles corridor, the MTA developed conceptual plans for a light rail transit system for commuters. 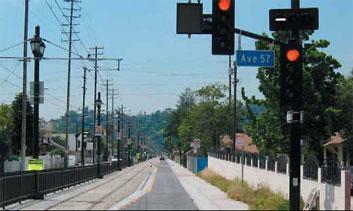 Value Engineering - Dynalectric modified pole sizes and lamp types to provide the required lighting effect within Pasadena and South Pasadena while maintaining the project's fixed budget. Purchasing Strategies - Dynalectric reduced the number of vendors required for decorative lighting, allowing assembly and wiring of all components to be completed smoothly in the field. Long lead time items were ordered well in advance to ensure timely delivery of equipment and materials. Fast-Track Scheduling - Careful planning ensured adherence to a two-year construction schedule. With work sites scattered, Dynalectric maintained a contingency equipment and labor pool to enable rapid deployment. Dynalectric's general foreman or project manager drove the length of the job once, and sometimes twice, a day to assess overall construction progress and anticipate the next "hot spot." The Right Equipment - The project employed the latest in safety and security technology. Interconnected controllers with vehicle and train detection sensors were installed at intersections with stop indications for cross traffic instead of using railroad crossing gates.